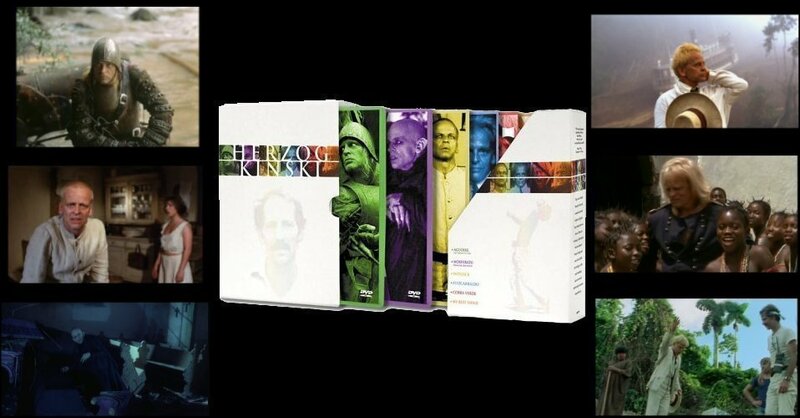 6 film, 6 disc collection of amazing films starring Klaus Kinsi and directed by Werner Herzog. Anchor Bay R0 UK boxset. Werner Herzog and Klaus Kinski worked together on five films over 15 years. Their relationship ranged between love and hate, with both men plotting to murder each other at times - but ultimately they produced some amazing films. In Aguirre (1972), Kinski plays a Spanish Conquistador, drifting down the Amazon with a gradually decreasing bunch of soldiers, who is gradually going crazy and eventually becomes insane, declaring himself the Wrath of God. It marked an important step for Herzog who previously had only directed art-house films. Nosferatu and Woyzeck (1979) were shot back to back and represted Herzog's tribute to classic German literature and cinema. Fitzcarraldo (1982) saw Herzog go mainstream and represents the closest he got to Hollywood style film-making - it tells the story of a man who dragged a boat over a mountain to achieve his dream - famously, Herzog actually moved a real boat to shoot the film, and it looks amazing. Their final co-production, Cobra Verde (1987) sees Kinski almost burnt out and is the least of their works together, but it is still a fascinating film. My Best Fiend (1999) was shot 8 years after Kinski's death and represents Herzog's tribute to their work together with lots of archive clips and stories about the man. The Herzog Kinski collection includes two of the best films ever made as well as three films that are worth watching. It comes recommended. Visuals All films are in Original Aspect Ratios (from 1.33 to 1.85) and the widescreen films are Anamorphically Enhanced. The picture qualities are generally good with minimal damage, although the transfers are poor - there is a general softness in all the films probably the result of the NTSC - PAL conversion. The R1 American discs are much sharper. Audio German and English tracks are provided for the films (Woyzeck is German only). There are some 5.1 tracks provided, although these are rather flat remixes. Subtitles English subtitles are provided for all the films. Extras All the discs include theatrical trailers, all but Woyzeck and My Best Fiend have interesting audio commentaries. Packing Cardboard box contains 6 thin-pak DVD cases. Fitzcarraldo and Nosferatu are available individually. Other regions? These films are available in an identical boxset in America with better picture quality. There are some other single disc releases. Cuts? All films are believed to be fully uncut. A fascinating heritage of film making, and some of the best films of all time. Highly recommended. A mixed set, many suffering from bad transfers compared to the identical American boxset. All text in this review written by Timothy Young - August 2006.